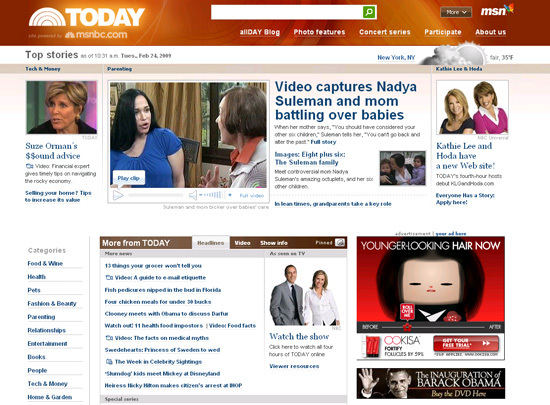 NBC’s “Today Show” has a new Web site, dropping the standalone look it had been using in favor of the standard MSNBC-branded site look. The new site featuers the familiar MSNBC.com layout with a “top stories” area, a tabbed “more” box and sections that allow users to control the number of stories that appear in each. The header’s flowing gold and orange hues match the show’s on-air look. While this new look is more uniform with the MSNBC.com brand, it’s not quite as engaging as the old design, which used a more cohesive look. Also of note: the show’s fourth hour hosts, Hoda Kotb and Katie Lee Gifford, have their own site now as well: KLGandHoda.com. MSNBC.com has continued its strategy of focusing more on individual show brands on their sites, making the MSNBC name secondary. Other sites, such as CNN.com, have show pages that match the look and feel of the show’s on-air graphics, but this tends to be placed below the CNN.com branding and navigation. MSNBC, on the other hand, typically makes the show more prominent, even to the extent of recoloring the header bar and only having a small “Powered By MSNBC.com” tagline. PLEASE NOTE: This is a blog post about the Web site of the fourth hour of Today. If you have questions or comments about NBC’s Today Show, please e-mail NBC at TODAY@nbcuni.com.